Home / Unlabelled / BATTLING DEPRESSION WITH THE QURAN – HOW? 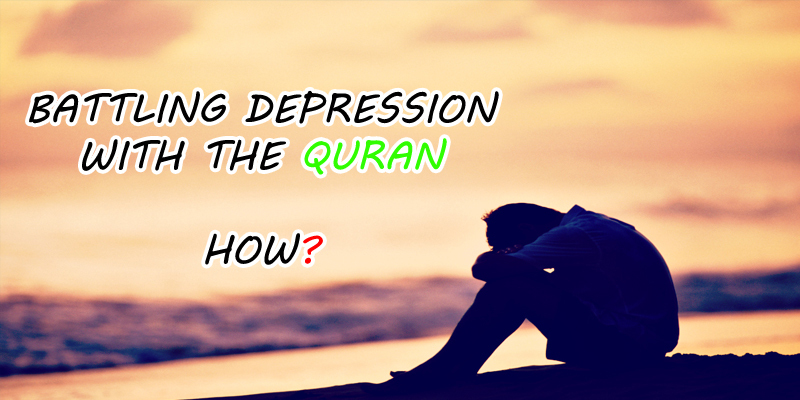 BATTLING DEPRESSION WITH THE QURAN – HOW? Contrary to what humans would like to believe, life is not a bed of roses. It is a journey, where we stumble upon pain, calamities, heartbreak, loss, desolation, and helplessness. Sometimes, we find ourselves falling into an abyss of darkness. It is so deeply consuming that you think you might never come back up. You try to paddle your way up, trying to get some air into your starved lungs, but you find yourself tired from the continuous struggle and eventually your limbs give out and you are stuck. Stuck and alone – without an escape. That, in a nutshell, is what depression feels like. Depression does not need a reason to exist. Sometimes it is just there, hanging around the corner, staring at us. It can be exhausting and utterly draining on a person mentally and physically. Depression is not sadness. Sadness is temporary while depression is long-term and it is very much real. However, for those of us who personally face these depressive demons on a daily basis, there is hope for us to overcome them. Islam has equipped the believer with the essential tools to fight depression and recover from it. The greatest tool being the blessed Holy Quran itself. From a psychological perspective, having a strong and healthy bond with Allah can directly lead to better mental well-being. This relationship with God needs to be built on unrelenting trust in Allah, His plans and His Will. Allah never forsakes His believers. If the believer trusts Allah blindly, Allah proves enough for him. If you feel yourself drowning in depression, recite the Holy Quran more often. One of the biggest causes of depression and anxiety is the fear of the unknown and the uncertainty of the future. The feeling of not being in control of your circumstances or the events in your life can cause restlessness, desolation, and frustration. By reciting the Quran, one is constantly reminded that it is only Allah who has control over all affairs and He has a plan for each and every one of us. Every single thing that happens to us is part of a bigger and perfect plan that our Lord has for us. Ultimately, nothing is in our control. It is all in the hands of Allah, so why should we despair? When we know God is looking out for us and He has power over all things. Upon reading the Quran, man is also reminded of the transitory nature of this life. Nothing is permanent in this world. This world is nothing but a platform of trials and tribulations for mankind which will eventually perish and a permanent world will emerge – that of Heaven and Hell. Allah created this world to test us. And God tests those He loves and He asks His faithful believers to bear those trials with patience and tawakkul. Sometimes, these trials and tribulations are also a means to elevate the status of a believer and for the purpose of the expiation of his sins. If a believer bears the trials in this world with the intention of pleasing Allah, He promises eternal rewards in the Hereafter. This life is created for hardship, loss, and disappointment. It is only our faith in Allah that can enable us to bear these worldly trials and keep ourselves focused on the ultimate goal of an eternal life in Paradise. Through the recitation of the Quran, our hearts find ease. And we are reminded about the endless favors of Allah upon us. At the end of the day, it is our faith in Allah that can keep us afloat in this world. The key is to trust in the power of Allah and His infinite wisdom to know what is better for us and what is not. He loves us beyond measure. And He waits for us to rely on Him so He can give us beyond measure as well – in this world and the Hereafter. This world and its trials are all meant for one purpose: to bring us back to Him. Allah afflicts us with hardship so we may find solace in Him. He tests us so we may rely on Him to get us through it. And He sends calamities in our path so we may call for His help and His help alone. He only wants His servants to remember Him and turn to Him and to not get lost in the rat race of this worldly life. And He wants man to realize his purpose of creation – to worship Him. We should supplicate to Him with firm faith in His providence and His control over everything. He will only decree what is best for us. This serves as a wonderful example of a dua we should recite in order to ease the matter of our hearts and souls. There is always hope for healing in Islam. Nothing is impossible for Allah and there is no abyss you can reach that is beyond His help. The answer to depression lies in the words of Allah and His infinite wisdom. Trust Him, for He will never forsake you and He is the best of Planners!